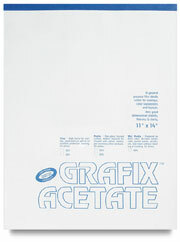 Clear Acetate may be used for graphic overlays and protection of art work. Clear Acetate is available in rolls, sheets or pads. A piece of copy paper is about .004" thick.